Johnny Linville was born in Bay City, TX October 5, 1949 the oldest child to Billie and Gene Linville. This is a hard story to tell. John was the story teller of the family, and we will never be able to tell the story as he would have told it, but we will give it a try. For the record, those that knew him are aware he was a great embellisher as well, so please forgive us if any of this could have come from one of his embellishments, but he wouldn’t want it any other way. He grew up in Del City with his 3 sisters and 1 brother. To hear him tell about the story of his childhood, he started driving at 14 and would drive a lot of cars his dad was fixing up before selling. He had many jobs in his youth, one of which was as a shoe shine boy at a barber shop and is proud to say he once shined Conway Twitty’s boots. He loved and rode horses, going camping and motorcycle riding with family. He attended Del City Elementary, Kerr Jr. High and graduated from Del City High School. During his school years he was active in band, sports and DeMolays. He then enlisted in the Army at 17 years old. After coming back from the Army, he joined his dad at their family owned business BJ’s Body Works and in 1972 he married the best thing that ever happened to him, his wife Suzy. After going to a Christmas party with Suzy’s family, her cousins said, “Hey did you know…” and told him he could use his VA Benefits to go to college and it would also give him some extra money to spend on something else. John decided he wanted a boat. Pretty sure he wanted the boat more than going to school, but he knew he would have to go to school to cash in on the GI Bill. He started school not knowing what he wanted to get out of it, so he majored in Business. This is where he found his passion. He loved school and he was really good at school, so he decided to change his degree plan to a Business Teaching degree. After college he went back to his alma mater and started teaching at Del City High School. He enjoyed his students and teaching so much that he also began sponsoring many of the school programs such as DECA and Student Council. He loved having his students over to the house. Many homecoming floats were built in the garage, the students would show John and Suzy how to line dance on the back patio, and it became the norm for the students to come over for many events. He took his work home with him, but in a good way and the two lives intertwined. Of course, teachers didn’t make a lot of money, so he and a few other teachers decided they would sell Christmas Trees in the winter and Fireworks in the Summer for some extra income. Funny thing is fireworks are illegal in Mid-Del, so he would haul the firework stand out to Nicoma Park and then back home to park in his backyard every night. Suzy was not a fan of the firework stand in her yard. He loved horses, and decided his kids needed to grow up with horses. He built a small barn with his father in the backyard and went out and bought a black beauty and we named her Grandma. She was so beautiful, barely got rode, but she was a wonderful family pet. We also adopted a horse and Leisha named her Crackers. Then John’s dad got a colt named Prissy. We are pretty sure they thought it would become a famous race horse, so they built an even bigger barn. Prissy also wasn’t ridden much and become a beloved family pet as well. His greatest joy was his kids. He was so proud of Leisha getting into his passion of band. He loved coaching baseball and softball with Patrick and Missy. Amazingly neither can remember him missing a single game even though they played a lot of the same days. Then Remington Park opened, and boy did he like going to the horse races and to the casino. During all of this he went on to get his master’s degree while working and became Assistant Principal at the Mid-Del Vo Tech and on to become the Director of Transportation for Mid-Del Schools. 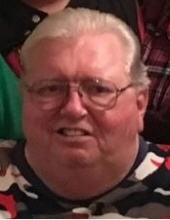 He was a member of many professional and civic organizations including being President of Del City Chamber of Commerce, Commander of Post 73 Del City American Legion and State President of Oklahoma Association for Pupil Transportation. He became a wonderful speaker and John loved to speak at various youth and civic organizations. He loved a microphone in his hand and to be in front of a crowd. He was the auctioneer for years at the Chamber Commerce and other organizations. He was a Bingo caller. He loved everywhere there was a microphone and a stage. Then came the grandkids. The ornery boys, Grant, Reed, Hayden and Grayson and that special little girl, Danily. He grew frustrated the past few years because his health prevented him from doing all the things he loves like camping, fishing, sports, and boat riding with those kids. He knows they won’t remember him walking and not being sick. He really wanted to do so much more. We want to remember Papa John as a caring loving ornery old man who loved his family. He has moved to a better place where he can be free of doctors, medicine and pain. Where he may walk and even run. He leaves behind a wife, Suzy and 3 children, Leisha, Missy (Dana) and Patrick (Andrea). A daughter in law, Dana, and 5 grandchildren, Grant, Reed, Hayden, Danily and Grayson. His Father, Gene and sisters, Debbie, Linda, and Leda. He is preceded in death by his mother Billie Jean, his brother Billy, and son-in-law, Warren. To send flowers or a remembrance gift to the family of Johnny Linville, please visit our Tribute Store. "Email Address" would like to share the life celebration of Johnny Linville. Click on the "link" to go to share a favorite memory or leave a condolence message for the family.